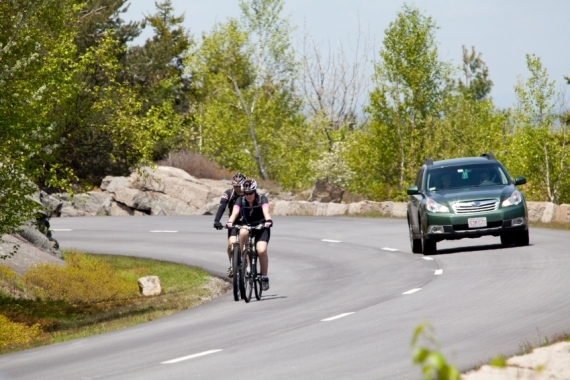 When you’re behind the wheel of a car, what crosses your mind as you encounter a bicyclist ahead of you? If you answered c, you’re in the minority. Unfortunately, statistics would seem to indicate that many drivers today aren’t focused on protecting a bicyclist’s safety. According to The National Highway Traffic Safety Administration (NHTSA), 677 bicyclists were killed by collisions with motor vehicles in 2011, accounting for two percent of all traffic fatalities that year. Nine percent of those bicyclist deaths were children under 14 years old. A 20-pound bike and its rider have little protection when struck by a two-ton vehicle, even if the collision occurs at a low speed and the bicyclist is wearing a helmet. That’s why it’s up to the drivers of motorized vehicles to protect their friends on two wheels. Alissa Simcox is the director of education for the Washington, D.C.-based League of American Bicyclists, a national bide advocacy organization whose goal is to get more people riding bikes. She says that protection starts by having the right attitude. Simcox says that by keeping that in mind when you’re behind the wheel of a car, and remembering that you might be the one on the bike someday, will help drivers and bicyclists alike see one another in a different light. It’s important for drivers to respect and protect bicyclists, not just because it’s the right thing to do and it prevents deaths or injuries, but also because it’s the law, and because bicycling is gaining in popularity. “Biking is on the rise,â€ Simcox says. She points to millennials as one age group where ridership is increasing. There are going to be more bikes on the road being used as transportation and not just one for recreation in the years ahead. These bicyclists have a legal right to be there, have to follow many of the same traffic laws as vehicle drivers, and are protected by laws passed with their wellbeing in mind. Safe-passing laws are one type of protective measure. An increase in safe-passing laws has come with the rise in bike ridership during the last few years, Simcox says. Most states designate a three-foot-wide berth as the minimum legal distance motorists have to give bicyclists when passing, with some states requiring that distance to be four feet. •	Slow down when passing. A study referenced on Bicycling.com found that people were eight times more likely to be killed when struck by a car traveling at 30 mph as compared to 20 mph. •	Look for, and learn, bike hand signals. Motorized vehicles have turn signals to indicate driver intentions. So do bicyclists. Watch for them, and know what they mean. •	Beware of child cyclists. Kids are unpredictable, particularly when they’re on a bike. They also might not have as much control as compared to an adult cyclist. Because of this, use extra caution when driving near them. •	Look for bicyclists. Like motorcycles, bikes are difficult to see, particularly when your brain expects to see a large vehicle instead of a small bike. Be particularly vigilant at night and look for bicyclists’ reflective materials as well as their blinking rear- and front-facing lights. •	Left-turn danger. Too often, drivers making a left turn in front of a bicyclist underestimate the cyclist’s speed, thinking they can complete the turn before the cyclist approaches. •	Appreciate bicyclists. A bike on the road means there’s one less car on the road, which translates to less traffic for motorists. Additionally, bicyclists are trying to get around, like you; it’s just that their mode of transportation makes them far more exposed than yours. All the responsibility for helping protect bicyclists doesn’t just fall to motorists, however. Bicyclists need to shoulder some of the load by being proactive and taking responsibility when it comes to sharing the road with motorists as well. Simcox and the League of American Bicyclists recommend the following five “Rules of the Roadâ€ for bicyclists. That spirit of cooperation, along with motorists and bicyclists understanding and following established best practices for avoiding collisions, will also help reduce the preventable injuries, deaths and heartache that all too frequently accompany vehicle-bike collisions today.